Hey there friends! It's Erin and Leslie over at First Grade Fanatics. 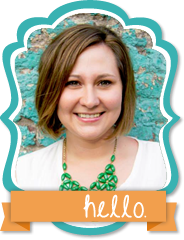 We are so excited to get to be guest bloggers for such an amazing blogger! Thanks Anna! 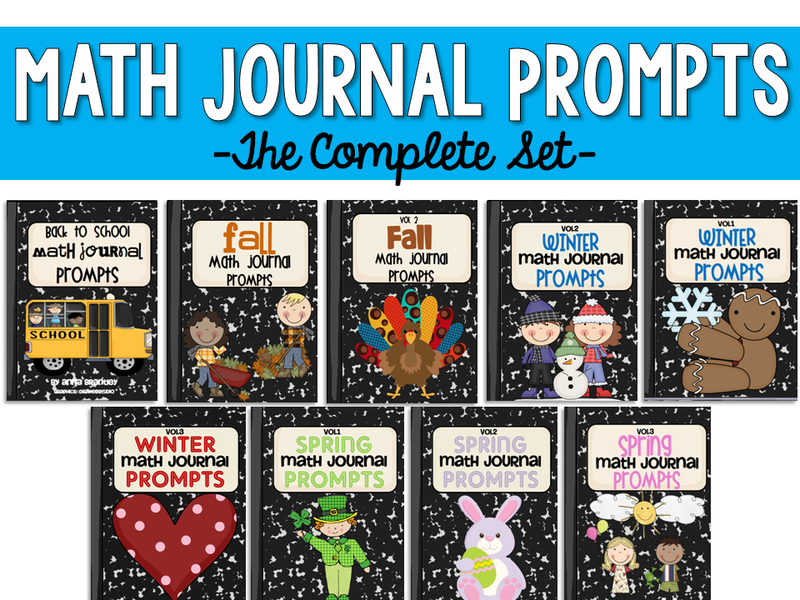 We've really been working on greater than and less than with our little firsties, so we thought we'd share some fun stuff with ya'll. 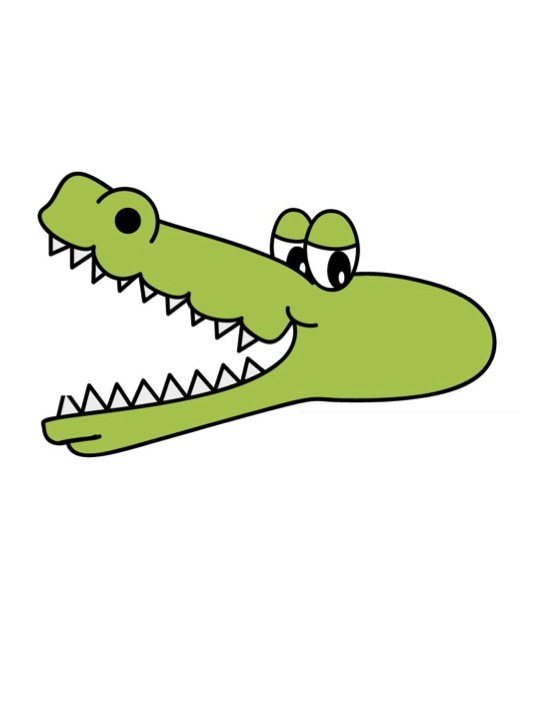 We started over at Super Teacher Worksheets because they have a super cute little alligator that we used to introduce the concept. Isn't he the cutest? We quickly moved beyond Mr. Alligator to teaching the symbols, but really found that using him did give the kids a great visual to remember which symbol to use. 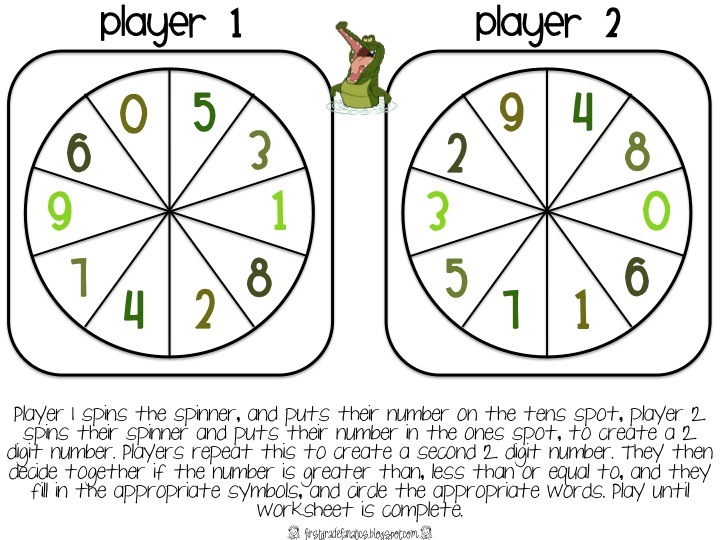 Here is a worksheet that we used with the alligators, but you could definitely use it for just symbols as well. You can find the black and white little alligators HERE at Super Teacher Worksheets. We didn't love their worksheet, so we made our own. Make sure to grab a copy below. 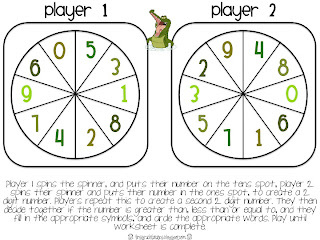 Next we did an activity with the kids using whiteboards where we came up with 2 numbers that they wrote, and then they picked a card with a symbol to put in the middle. Make sure to click below to get a copy of our signs. They worked really well for the kids! 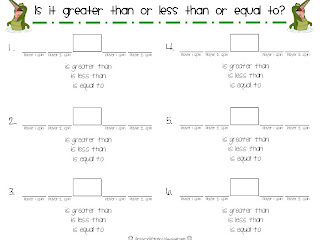 We really want our first graders to be familiar with the correct language to use when comparing two numbers. 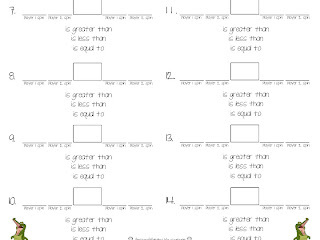 The worksheets below contain boxes for students to write the correct sign in, and phrases to circle. We ended the week teaching our kids to play this game. 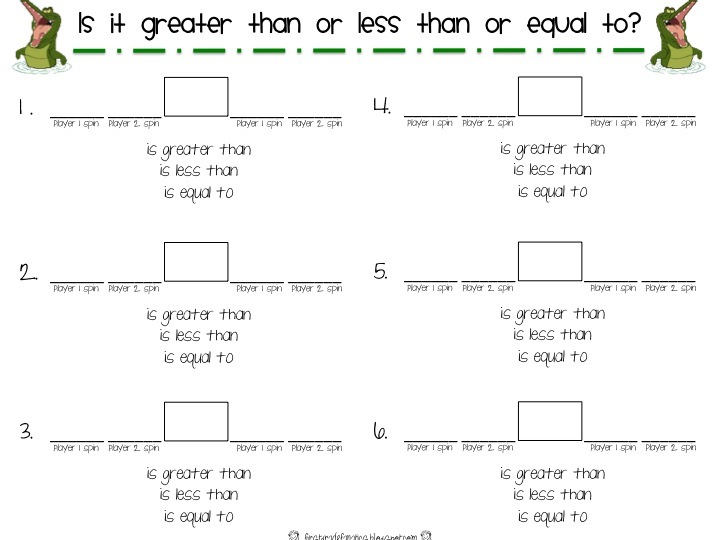 This was a huge help in reinforcing greater than, less than and equal to. Here's a copy for you! Thanks for sticking with us! Do you have any other ideas for teaching this strategy? We'd love to hear from you! Don't forget to stop on by our blog and say hello. 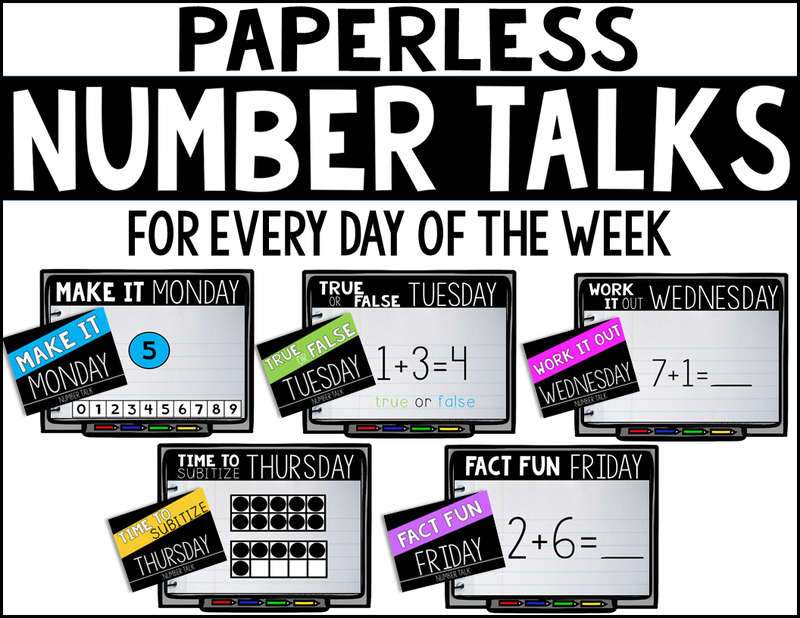 We've got all sorts of fun freebies and printables to share! Have a great day! So cute! Thanks a bunch! Great ideas! 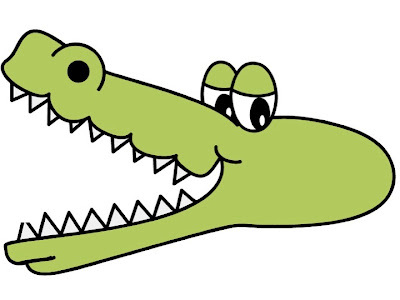 My district math coaches have told us to NEVER use the alligator visual but I still have for some of my kiddos who are really struggling understanding it. I also figure that if I can have them then say the "sentence" correctly then what does a little alligator hurt...anyways, it's technically a no no for us but I know my kiddos. 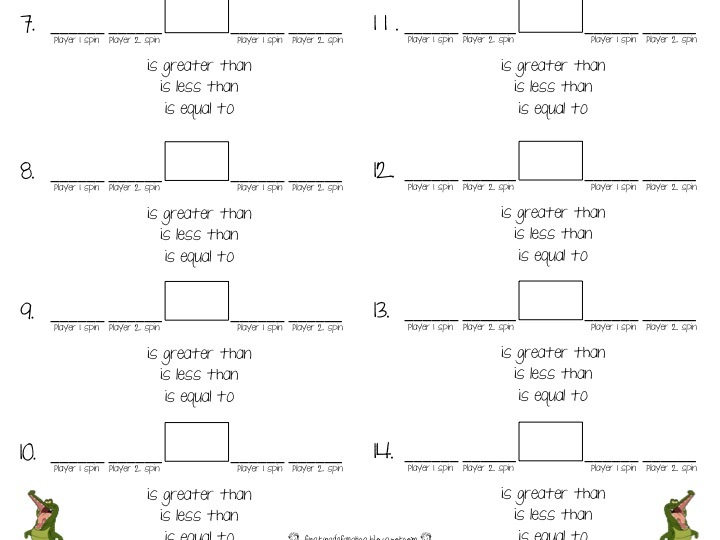 I like your worksheet that has the symbols on them and their words that go with it. They need that reminder sometimes. Thanks for sharing! This is great. I just introduced greater than, less than Friday to my kinders!! 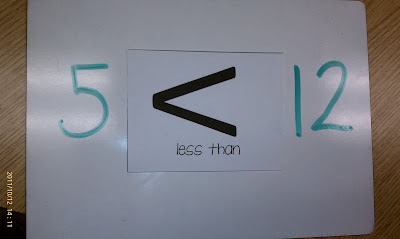 I can't wait to try these- Everyday Math doesn't teach this for a few mor units, but I'll be sure to pull these out! I'm also excited to try an idea from teacher tipster.com-- he has an actual alligator or crocodile head that is open like the < > symbol-- my dad found me one & the kids are completely fascinated by it. kinda gross, but hopefully memorable! 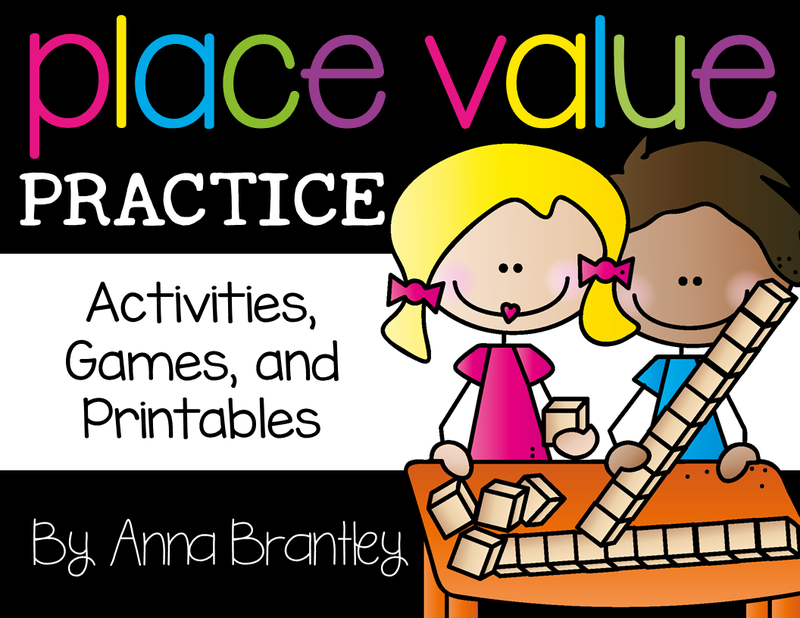 Great activities and visuals- we're starting this next week in our first grade. Thanks for sharing! Better late than never, but thanks so much for these freebie games! 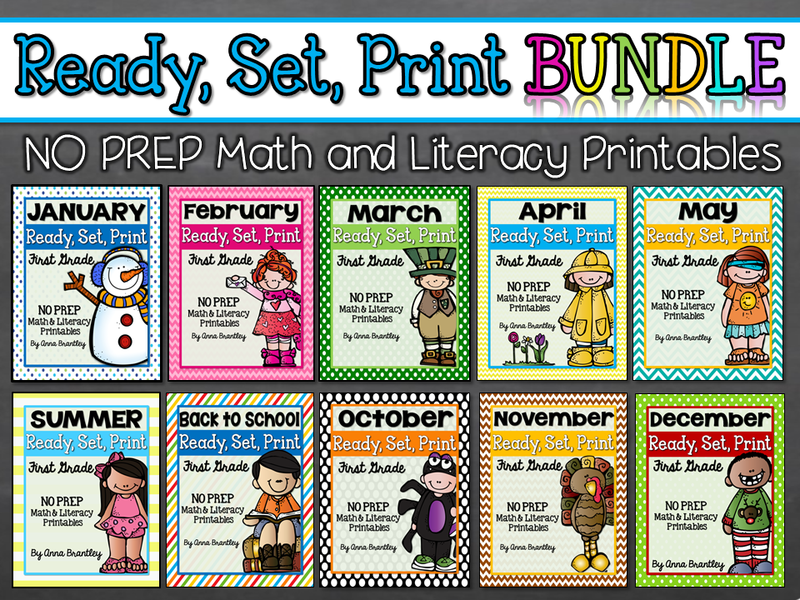 I am printing these and and filing them away for the fall! I cannot WAIT to try these tomorrow. Thank you SO MUCH for such a great resource! Hi Anna, I can't seem to access the google doc where the game is, Is there any other way to send it to me! LOOKS GREAT! thanks! I am trying to find the black and white printable alligators. I'm sure I have done something wrong. 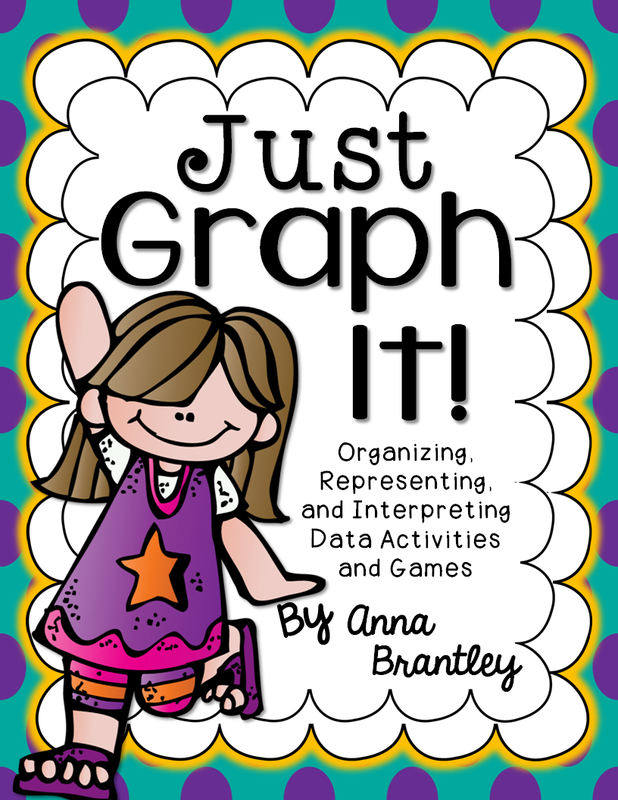 Thanks so much for this wonderful resource. I will be using it tomorrow for a review!